The Fort Lauderdale Jungle Queen Cruise Offers the Best Trips! Looking for original activities to do while visiting Fort Lauderdale, Florida? Create memories you’ll never forget on the Fort Lauderdale Jungle Queen Cruise! This festive form of transportation is one of the best ways to spend time with loved ones. Full of history and beauty, the “Venice of America” will steal your heart from the decks of the legendary Jungle Queen. Here’s everything you need to know before getting on board. If you want to discover more fun things to do like the Fort Lauderdale Jungle Queen Cruise, request access to our free Vacation Guide. It will provide you with ideas for activities, restaurants, and events that fit your needs while you’re with us. Get your copy today! What Is the Fort Lauderdale Jungle Queen Cruise? The Fort Lauderdale Jungle Queen Cruise is one of the most popular attractions in town! Here is what you can expect when you go. The Jungle Queen Cruise was started in 1935 by Al Starts, who wanted to provide sightseeing tours along the New River. In 1958, the company was bought by Earl Faber and the boat’s famous Vaudeville shows were added. When he passed away in 1963, his son Jerry took over and has owned and operated the company since then. More than 50 years later, the Fort Lauderdale Jungle Queen Cruise continues to take thousands of visitors each year on a relaxing and fun adventure along the city’s waterways. The Fort Lauderdale Jungle Queen Cruise offers several expeditions during the day. You can embark on a 3-hour narrated ride whenever you prefer: 11 a.m., 1:30 p.m., 4 p.m., or 7:00 p.m.! Sail beside luxurious waterfront mansions while learning insightful details about Fort Lauderdale’s history. Then, drift away from the shore to the company’s very own tropical island! There, discover spectacular exotic animals such as alligators, parrots, iguanas, and even monkeys! This activity is very kid-friendly, making it an exciting adventure for the entire family. An Extraordinary Night Onboard with a Delicious Dinner and Shows! The Fort Lauderdale Jungle Queen Cruise also offers an evening cruise for those who want to spend a magical night on the water. Sail away and enjoy an all-you-can-eat dinner serving BBQ, shrimp, chicken, and a variety of yummy sides. Colorful shows, inspired by the originals, will entertain you as you eat. In addition, the boat’s comedy acts are guaranteed to make you laugh out loud after dinner. Check the calendar for availability and make your reservation! Make your adventure in Fort Lauderdale even more memorable and book our Harbor Haven 503 rental, just minutes away from the Jungle Queen Cruise departure! 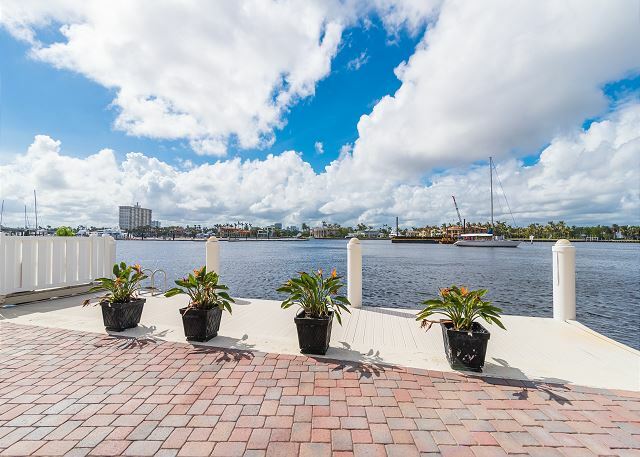 This beautiful 1-bedroom condo offers spectacular Intracoastal and Downtown views. A stay here will make your visit with Fort Lauderdale Stays a cozy and elegant experience! Enjoy its premium amenities like flat-screen TVs, a wine refrigerator, and fully covered parking spot. All of our rentals include complimentary necessities like fully stocked kitchens, heated pools, and fast WiFi. You can even enjoy free Starbucks coffee, provided in each of our beautiful rentals. After enjoying a fabulous evening aboard the Fort Lauderdale Jungle Queen Cruise, rest your head in style with us at Fort Lauderdale Stays! We can’t wait to host you.